The game was live on BBC1, as presumably they thought that there could well be an upset. Unfortunately one of the commentators was the well known misery, Mark Lawrenson, who proceeded to add nothing to the game, except errors. Enough of that moan though. Looking at my notes from the game this morning, there were just three entries. The goal, Murphy's head injury and Wanyama's injury. Nothing else of note appeared to happen according to me. Saints were totally in control of the game, to the point where they seemed to be stuck in second gear, but there was always the feeling that they could step up, if required. It wasn't. 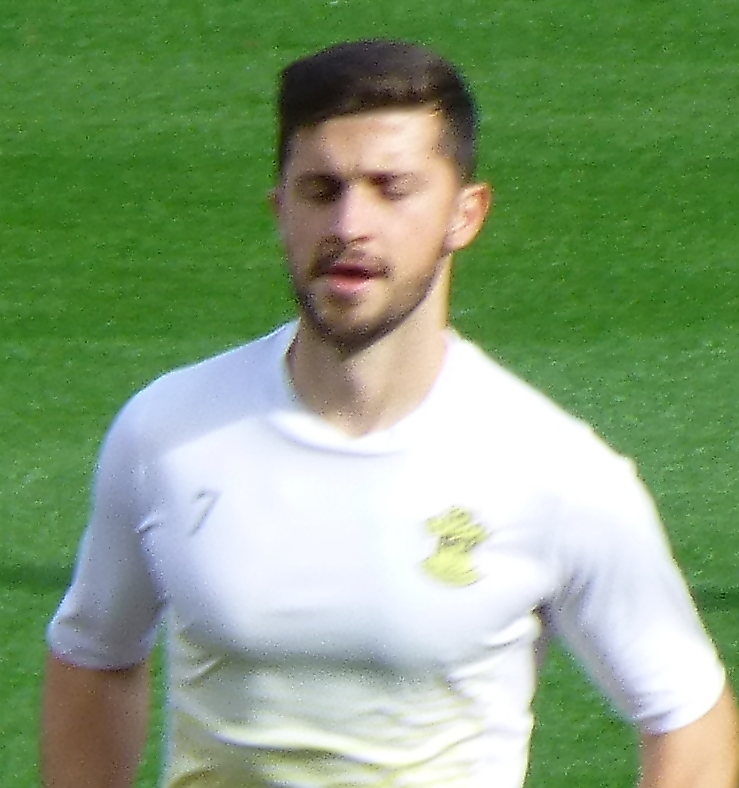 Saints success was based on two things, firstly there was Shane Long up front, doing what he does so well, namely running around and making a nuisance of himself. Oh, and scoring a very good goal. The second thing was José Fonte at the heart of the defence who had yet another excellent game. Nothing got past him. Over and above his own game, he was constantly organising Saints defence to great effect. However, there was a nasty shock for Saints fans before the game when we learned that, having already lost Alderweireld to an injury that would mean him being out for at least the rest of the month and well into February, Morgan Schneiderlin had now done something nasty to his adductor muscle and would also be out for several weeks. It would get worse before the first half of the game was finished. Ipswich started brightly enough, but as in the last match, Forster was hardly troubled. Saints were playing the three centre back formation, made up of Gardos on the right, Fonte in the centre and Bertrand on the left. The full backs, Clyne on the right and Targett on the left, effectively playing in midfield. I don't particularly like this formation, but it snuffed the life out Ipswich, their centre forward, Murphy cut an ever more disconsolate figure up front. Ipswich did get the ball in Saints net, early in the first half, but Hunt was offside. When the Saints goal came, it was a surprise and caught the BBC commentary team out, they didn't react until the ball was picked out of the back of the net. There was some very neat interplay in the build up between several Saints players, before Ward-Prowse's shot/cross was intercepted by Chambers, but he only succeeded in pushing the ball straight out to Shane Long. In a flash, Long reacted and the ball was in the net, giving Bialkowski no chance to even react. The one moment of real Premier League class in the entire game. At the half hour mark, the somewhat isolated Ipswich No.9, Murphy was involved in a clash of heads with one of his own players and it took a while to stop the bleeding, apply an effective and very distinctive head bandage and also find a clean shirt. He played the rest of the match in the unnumbered plain shirt. The only other thing of note in the first half was Wanyama's injury. After the match, Ronald Koeman said that he had arranged with Wanyama and Davis that they would play 45 minutes each. But with just seconds left in the first half remaining Big Vic suddenly pulled up with a very obvious hamstring injury. That will mean he will also be on the sidelines for several weeks. All of a sudden Ronald Koeman has some real problems, with the treatment room filling up with the first team's star players. If you listen carefully to the post match interview (on the second tab above), the concern in his voice is clear, especially when he talks about possibly having to dip into the transfer market. Steven Davis started the second half in BigVic's place, but it was business as usual, with Ipswich making no impression whatsoever on Saints defence. It was obviously also apparent to Mick McCarthy, as he replaced Hunt with Mings. The ex-Saints Academy player immediately started to give Clyne a bit of a torrid time, although Saints were soon mack looking for the second goal that would put the tie out of reach. 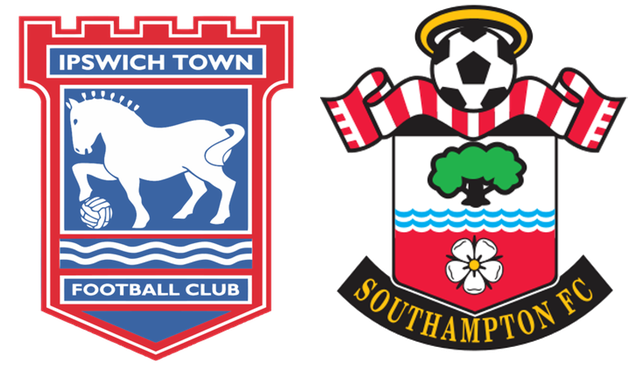 The Ipswich fans tried to lift their team, but the tie continued to slip away from them, as Saints gradually squeezed the life out of them. The final whistle was a relief to all involved. For Ipswich, who can now concentrate on getting promoted to the Premier League; Southampton, who can look forward to a home tie against Crystal Palace in the next round and everyone at home who had to listen to Mark Lawrenson.